This board is a Resistor Capacitor (RC) oscillator with output pulse amplifier. 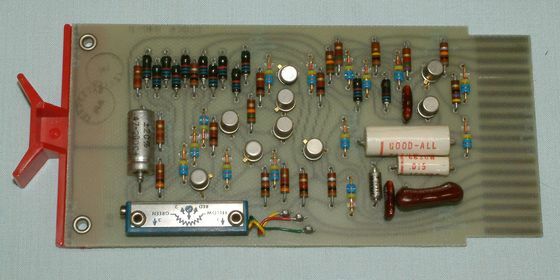 This revision D board layout was done in March 1965. Frequency is set by selecting on the backplane one of the 5 on board capacitors to select the frequency range and then using the on board pot to set the desired frequency. The board can generate 30 Hz to 2 MHz. The frequency is stable to 1% with 20% change in power supply. This board cost $45 in 1968.